A Jewish wedding is not complete without the 7 blessings of the Sheva Brachot. At the ceremony, it's the last thing to happen before the breaking of the glass, and takes place at the end of the Birkat Hamazon, and, if the couple is lucky, during a festive meal on each of the six days following the wedding. Sheva brachot on Sheva Yomim! Seven blessings for seven days! In many places the Sheva Brachot are entirely done by the Rabbi(s) who perform the ceremony, but there are many places where family members are asked to take part by reciting one of the blessings. This can take place at any of the times Sheva Brachot are recited, and can be a surprise to those who are not prepared. 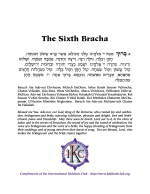 One custom is to give out individual copies of the brachot to those who are being honoured. Each person gets a little warning this way and has a chance to prepare. The PDF attached here has the brachot in Hebrew, English and transliterated for ease of use. You may notice that there are only 6 pages in the file. That's because the seventh page is the blessing over wine, which we know that every member or friend of the International Kiddush Club needs no written reminder. Get IKC products - Give IKC money! - The International Kiddush Club - Official Sponsor of Purim - accept no substitutes ©2019 Website by Interactivepages - willing to code for kiddush! - Chag Kosher Pesach!